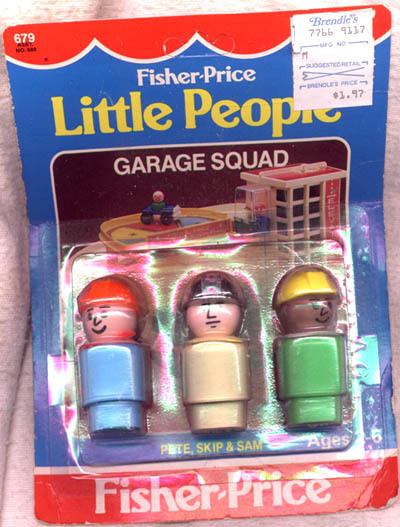 Description: This is a set of 3 Original Little People construction figures. These figures can be played with alone, or used as added accessories to other larger Little People sets. BZPP - Green body African-American construction worker with a white non-triangular scarf and a yellow construction helmet. EDPP - Tan body construction worker with a yellow non-triangular scarf, and a silver construction helmet. TPP - Light blue construction worker with an orange non-triangular scarf and an orange construction helmet. BYPP - Green body construction worker with a white non-triangular scarf and a yellow construction helmet. SPP - Light blue body African-American construction worker with an orange non-triangular scarf and an orange construction helmet. BDPP - Dark blue construction worker with an orange non-triangular scarf and an orange construction helmet.